This is another of our ‘how to’ workshops. It will allow you to explore first principles of photography and learn how to make stunning images using the simplest of equipment. We all spend so much time staring at screens and consuming digital images. For this workshop you will be slowing right down, beginning with making your own camera. 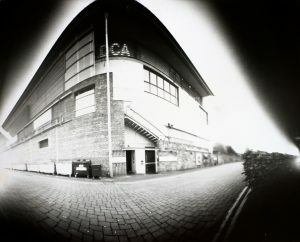 You will learn about the basics of pinhole photography followed by the magical chemical process of developing black and white prints in a darkroom. It will be a fast-paced but fun day and you will learn a lot in a short time. No experience is necessary and the workshop is suitable for anyone aged from 13 years on. It will be particularly good for anyone who works with young people as the skills are easily transferred. All materials are provided. We will be working outdoors for some of the time. She is currently working with historical photographic processes, primarily cyanotype, argyrotype, lumens, photograms and pinhole, as well as digital photography. She enjoys working with Museum collections and has collaborated with Bell Pettigrew Museum and MUSA in St Andrews, the Scottish Fisheries Museum in Anstruther and Dundee Heritage Trust Museums. She is a member of Dundee Print Studio and PrintRoom Dundee.